10 x Hopelessly Lax = ? The economist Sir John Vickers, himself an ex Bank of England Chief Economist, recently had a pop at the current Bank of England’s governor and chair of the Financial Stability Board, Mark Carney. He countered Carney’s assertion that “the largest banks are required to have as much as ten times more of the highest quality capital than before the crisis” with the quip that “ten times better than hopelessly lax is not a useful measure”. I particularly liked Vickers observation that equity capital is “a residual, the difference between two typically big numbers, of which the asset side is hard to measure given the nature of banking, and dependent on accounting rules”. In a recent article in the FT, Martin Wolf joined in the Carney bashing by saying the ten times metric “is true only if one relies on the alchemy of risk-weighting” and that banking regulatory requirements have merely “gone from the insane to the merely ridiculous” since the crisis. Wolf acknowledges that “banks are in better shape, on many fronts, than they were a decade ago” but concludes that “their balance sheets are still not built to survive a big storm”. 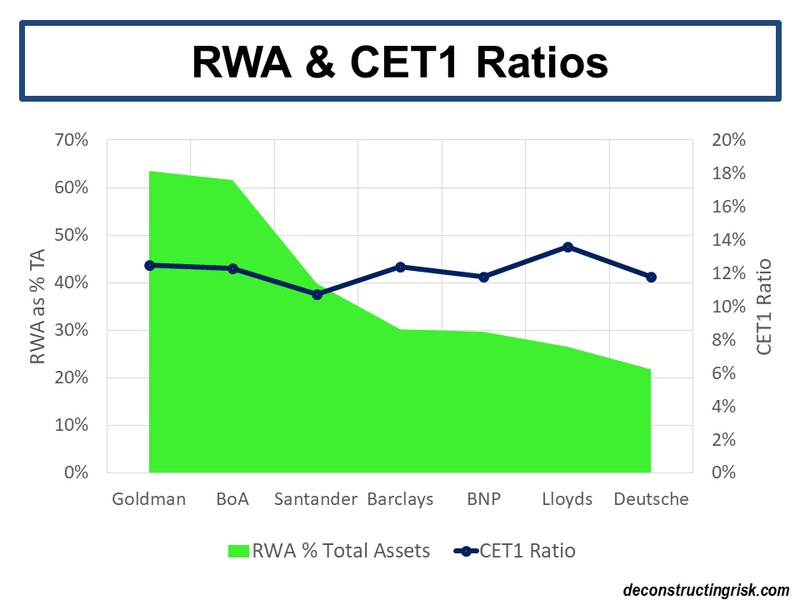 I looked through a few of the bigger banks’ reports (randomly selected) across Europe and the US to see what their current risk weighted assets (RWA) as a percentage of total assets and their tier 1 common equity (CET1) ratios looked like, as below. The wide range of RWAs to total assets, indicative of the differing business focus for each bank, contrasts against the relatively similar level of core “equity” buffers. Wolf and Vickers both argue that higher capital levels, such as those cited by Anat Admati and Martin Hellwig in The Bankers’ New Clothes, or more radical structural reform, such as that proposed by Mervyn King (see this post), should remain a goal for current policymakers like Carney. 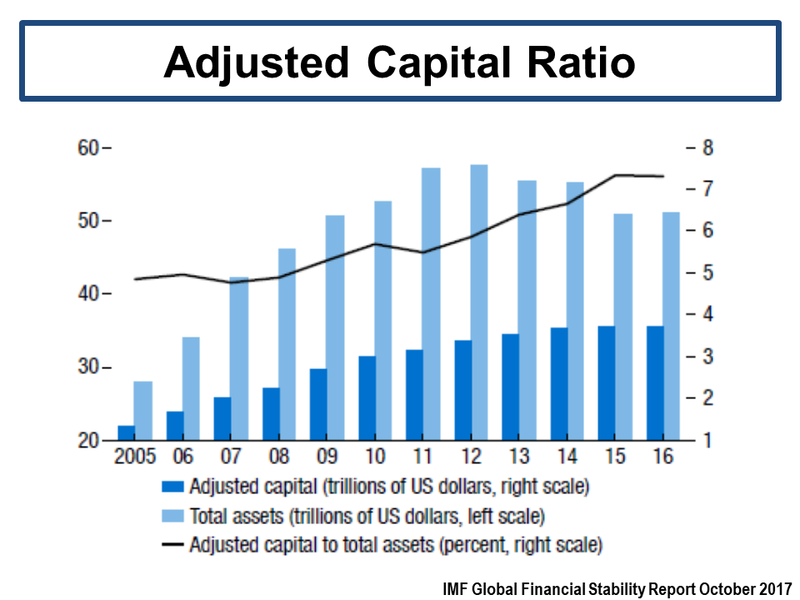 The latest IMF Stability Report, published yesterday, has an interesting exhibit showing an adjusted capital ratio (which includes reserves against expected losses) for the global systemically important banks (GSIBs), as below. This exhibit confirms an increased capital resilience for the big banks. Hardly the multiple increases in safety that Mr Carney’s statements imply however. This entry was posted in Economics and tagged adjusted capital ratio, Anat Admati, bank capital, Bank of England, banking regulatory requirements, banking supervision, Basel III, CET1, Chief Economist, expected losses, Financial Stability Board, global systemically important banks, GSIBs, GSIFs, highest quality capital, hopelessly lax, IFRS9, IMF Stability Report, Mark Carney, Martin Hellwig, Martin Wolf, Mervyn King, pawnbrokers for all seasons, risk weighted assets, RWA, Sir John Vickers, The Bankers’ New Clothes, tier 1 common equity. Bookmark the permalink.